These are from the FotR TE DVD extras, from two TV specials: one from FOX and one from the SCI-FI channel. They are obiously from the same scene, which seems to have been part of the Hobbiton Farewell Party footage, but which never made it into the films. I was browsing the Extras (as I have explained, until now I have never seen these features) and, Lo! 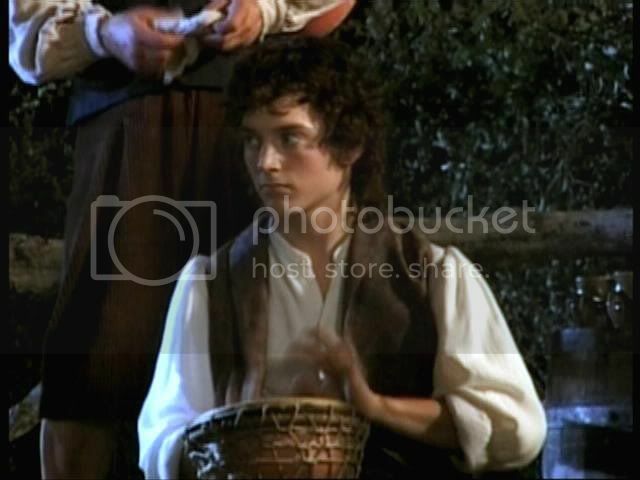 there before my eyes was film Frodo sitting on the floor, banging a tom-tom-like drum. 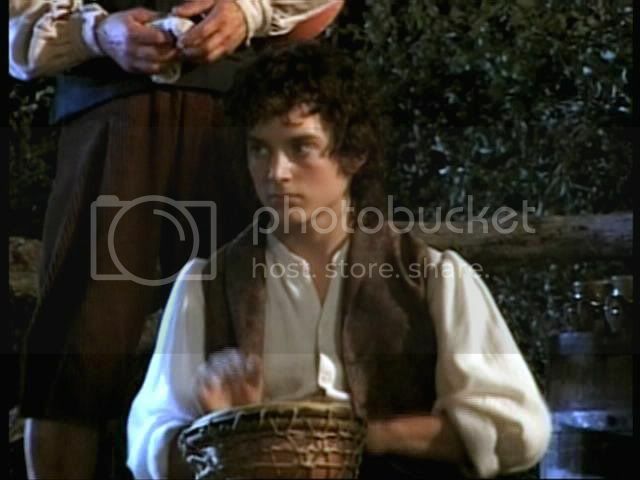 He was wearing a very intense expression, either because he was very in-character, or because Elijah Wood was trying hard to play a drum decently. 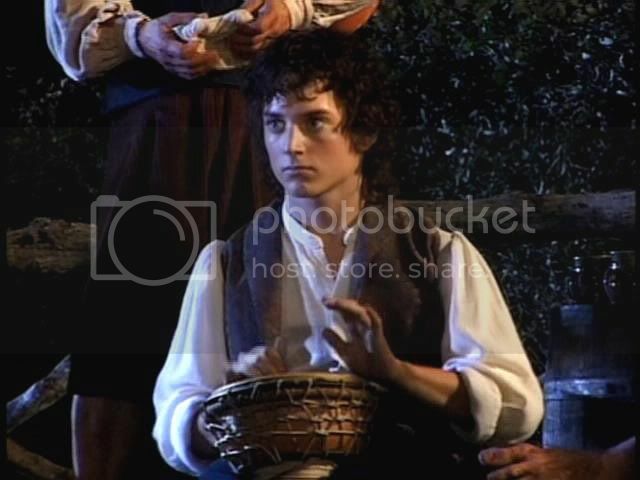 Whatever the cause of Frodo's expression, the images leapt out at me because I had just finished reading Belegcuthalion’s (aka “Cuthalion”) multi-chapter Frodo saga, Before I Go To Sleep. Early in the story, there is a scene at a celebration in which Frodo Baggins is seated on the floor playing a drum. I could not help thinking that the author had seen this film clip, and that the clip inspired her to write her scene. Here’s an excerpt from Cuthalion’s story, followed by my screencaps from the two specials…..
As the evening progressed and her stomach reminded her that it had been a while since luncheon, she sat down with Magnolia and Rosie to drink some chilled apple juice and to eat meat pastries, when there was a sudden riot on the dance floor. Two hobbits appeared among the dancers, one of them unknown to Lily, a tall young lad with a clever face and bright eyes, wearing his visibly expensive garments with careless elegance. The other one was Frodo Baggins. "Who is the stranger?" she asked Magnolia in a low tone. But Merry Brandybock didn't dance. He leaned against the raw banister of the dance floor, watching while the Master of Bag End had a small conversation with the musicians. 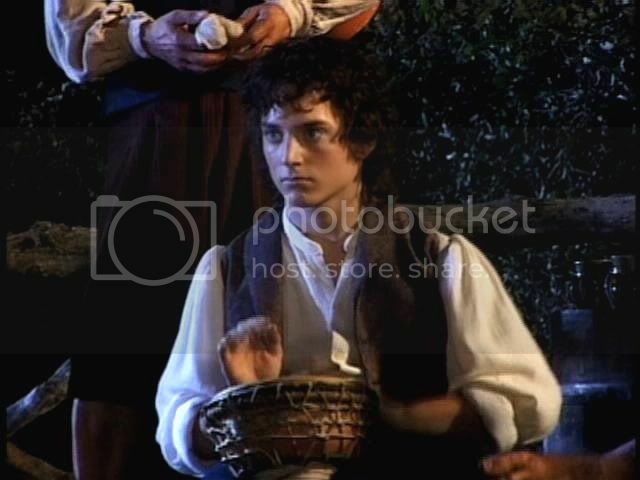 Then the crowd drew back from Frodo Baggins and Lily saw that he held the drum in his hands. He sat it on the wooden floor and lowered himself down behind it. He started to play, and slowly the hobbits around him grew silent. Lily could feel the music of the drum before she heard it. The beating of his palms became louder, a clear rhythm, urgent and strong. And then she heard the flute, filling the air with a strange melody... definitely not a Hobbiton tune, perhaps not even from the Shire at all, but piercingly sweet and beautiful. She saw that it was Merry Brandybuck playing. Without thinking she got up and moved closer to the dance floor, her gaze returning to Frodo Baggins. His face was quiet and nearly dreamy, his eyes were closed. His hands moved up and down, coaxing out the rhythm her feet were already following though she didn't realize it. She hadn't seen Frodo up close for a rather long time, and her eyes instinctively searched for changes in the fine, regular features she remembered with astonishing clarity from their last, close encounter. Surprisingly enough she found very few of them (as far as she could see in this light); he might as well have been the same young hobbit close to his coming of age who had comforted her on a Midsummer's day twentytwo years ago. One by one, more hobbits joined the musicians on the dance floor - lads and lasses, moving to the song, some of them easily, others rather awkward, but every single one attracted by the melody. Lily scarcely noticed them; the only one she really saw was the Master of Bag End. She was spellbound by the strange music and the magic of the moment; and then the beating of his hands slowed down and stopped. ~ from Chapter Three of Before I Go To Sleep, by Cuthalion. I never saw this! I can see that I have to go through those extras. I never did. His face certainly is intense. Yes, if you have never seen them, it is worth it. I got my copy from the local library, but it is usually at the video rental place, too. Most of it is virtually repeated in extras on the DVD Extras from the EE version, but not all of it -- especially if you are milking the footage for ever drop of film-Frodo or EW-in-costume-as-Frodo goodness. I don't remember seeing this before either! I have the extras from the theatrical edition, and thought I'd played all of the features. Perhaps I'd had an information overload at the time, and have forgotten. I'd better get them out again and look for myself! Well, you know, Maewyn, this is the beauty (or bane) of screencaps: things that go by in a sequence in the blink of an eye can be literally "captured" and made into far more than they ever were intended. 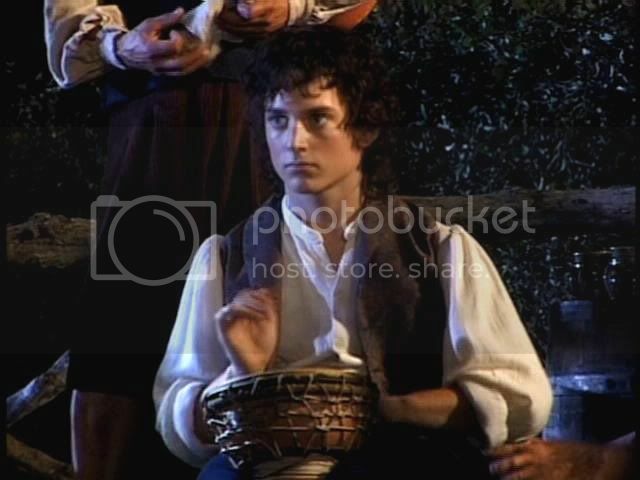 This was part of a fast little "blip" of Farewell Party material in both specials, to illustrate the film's portrayal of the world of the hobbits. The drum moment came and went in a flash. 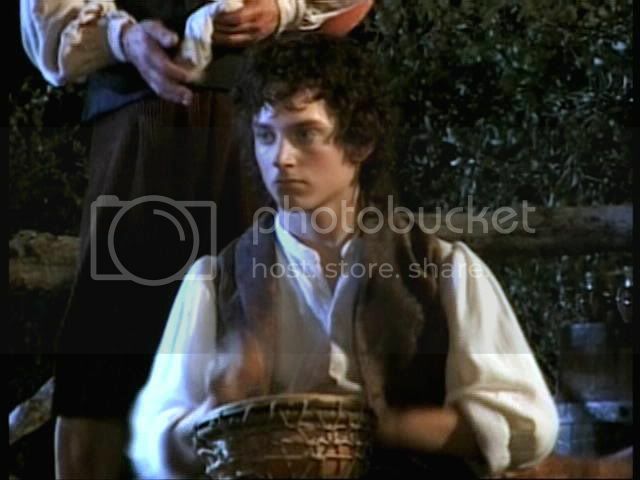 But, because I had just read Cuthalion's story, and she had highlighted the vision of Frodo playing a drum (which drew the heroine (and the reader) to him), I noticed at once. Of course I knew this scene! 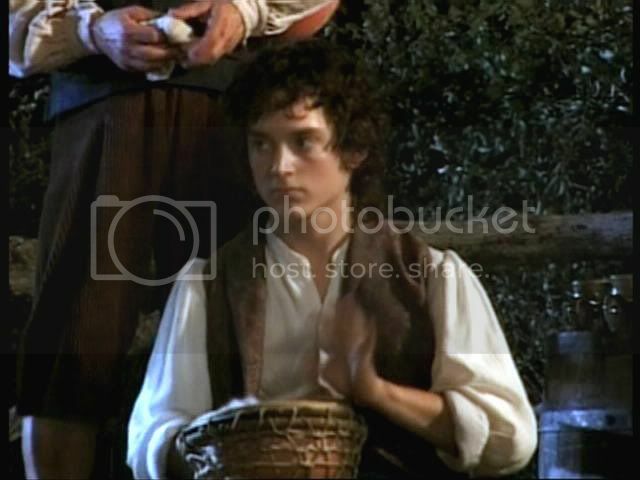 (In fact there would probably have been no moment with Frodo playing a drum on the dancefloor in Before I go to sleep had I not seen it in the extras of FotR). Those screencaps are wonderful. I grateful to the SCI-FI channel and FOX channel for having producing the specials that showed this moment -- just so it could have inspired you to write that scene in your story, which was not to be missed.